This surgical technique is done during open tendon surgery. To perform a debulking or debridement the surgeon will cut away any damaged/inflamed tissue and scrape down any calcium deposits (bone spurs) that have grown on bone. Scar tissue may be removed from the tendon fibers, tendon sheath surrounding the tissue or from both surfaces. Debulking or debridement of the tendon or muscle is used as a last resort, if all methods of conservative therapy have been exhausted, in chronic conditions. 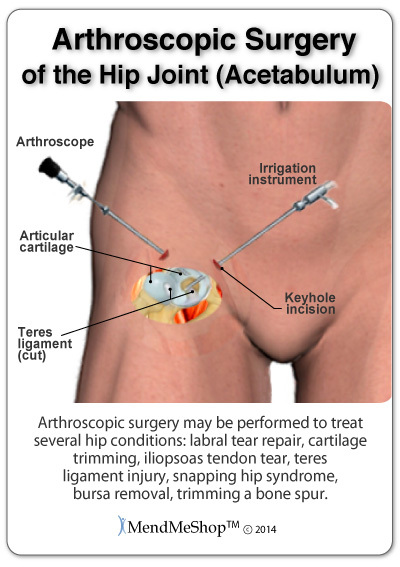 Hip arthroscopy can be a minimally invasive surgical procedure that is used to diagnose and/or treat hip conditions. If a doctor is unable to make a diagnosis following a physical exam, x-ray, and/or MRI, an arthroscopy may be performed to get a better look inside the hip joint so a diagnosis can be made. Depending on the severity and type of injury and the age and activity level of the patient, hip arthroscopic surgery may be required for repair if nonsurgical treatments have not shown improvement in pain, range of motion and other symptoms. A hip arthroscopy is usually performed with the patient under general anaesthetic. During surgery, tiny incisions (1/4" - 1/3") are made to insert the surgical instruments and a small arthroscopic camera that provides an internal view of the location of the surgery. Arthroscopic surgery is also used to treat knees, elbows and pretty much any other joint... however, the hip is a deeper joint and it can be difficult to insert the instruments and camera at the proper location. As a result, the hip joint may be distracted (opened up) by traction so space is created and the instruments can be used without damaging the labrum, cartilage and other soft tissue. Make a diagnosis for pain in the hip, groin or thigh. Remove torn pieces or cartilage or loose bone fragments in the joint. Remove or repair a tear in the acetabular labrum. Shave a bone spur that is causing impingement. Suture and repair a torn teres ligament or iliopsoas tendon. Remove or repair something that may be catching causing snapping hip syndrome. Perform a psoas tendon release to treat internal snapping hip syndrome. Repair an artery or other tissue damaged during a fracture. Proper post-surgery rehabilitation is very important, perhaps even more important than the surgery itself. 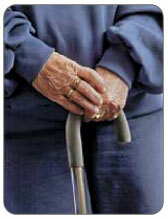 Most patients can leave the hospital the same day using crutches or a cane. You will be required to follow up with your surgeon and a physical therapist and they will advise you on your recovery. The goal of a rehabilitation plan is to manage pain and swelling while improving function, strength, and range of motion. Ultimately, you will regain strength in your hip and return to full activity. You will most likely spend a lot of time with a physical therapist after your surgery, but as your healing progresses, emphasis will be placed on your personal at home treatment. The success of your rehabilitation will depend on your dedication to working with your doctor and physical therapist while also managing your recovery on a daily basis at home. Regardless of what type of surgery you've had (or even if you don't need surgery) your home therapy routine can be improved by controlling initial and ongoing pain/swelling, and increasing blood flow to heal your soft tissue so you can achieve long-term, positive results. This can easily be done by incorporating the use of a Cold Compress or Ice Pack and a Back/Hip T•Shellz Wrap® into your rehabilitation routine. Consistent use of these conservative treatment recovery tools will decrease your time spent in recovery. Speak to your doctor, surgeon or physical therapist about incorporating T•Shellz Wrap® treatments into your post-operative rehabilitation program to boost your overall recovery process. 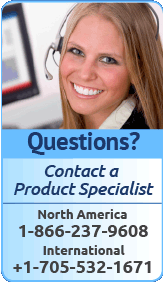 Questions About Conservative Treatments & Surgical Recovery? Each injury/condition will have different challenges for you after surgery. Your surgeon and/or doctor will provide you with clear direction on how to protect your wound and deal with pain so you can achieve a tolerable level of comfort during your recovery. Directly after your surgery has been completed, your hip will go through Step 1 of the healing process by stopping the bleeding that has started because of the incisions and work done inside of your hip. Depending on the type of procedure you have just had, your tissue may be sutured together, reconstructed or removed to fix your underlying condition. In any case, as with any injury to your tissue, the tissue in your hip area will be bleeding again. Depending on the type of injury you have, your surgeon may even stimulate bleeding during your surgery to trigger the healing process. Typically your body will have begun to stop the bleeding as soon as your surgeon has completed your surgery. This means that the veins carrying your blood will close off, and your blood will coagulate (condense to seal the bleeding off) in order to reduce the amount of blood loss in your body. Your body knows to do this automatically because blood is so vital to the healing process. Blood is basically the vehicle for oxygen, nutrients, white blood cells and anti-bodies that travel directly to the injury in your hip - where these things are needed most. In order to reduce pain, swelling and inflammation your doctor will prescribe an anti-inflammatory drug to be taken during the first 4 weeks after your surgery, or for however long it is needed, depending on your pain level. Your surgeon will also recommend the use of a Cold Compress or Ice Pack on a frequent basis - multiple times per day - to control your inflammation and reduce your pain. If you have undergone an arthroscopic surgery, you may have little bleeding/blood loss and your doctor or surgeon will check before you leave to make sure your bleeding at the incisions has stopped. If you have undergone an open surgery, your doctor and/or surgeon will check your incisions periodically over the next few days of your hospital-stay to ensure that your body has stopped the bleeding on its own and also make sure that your incisions are starting to heal. After your incisions, repaired and/or removed tissue has stopped bleeding; your hip will become tender, swollen, red and hot to the touch - these are all symptoms of inflammation. Step 2 of the healing process is inflammation reduction. At this point you will be home if you have had arthroscopic surgery, or you may still be in the hospital if you have had open surgery. In order to reduce pain, swelling and inflammation your doctor will prescribe an anti-inflammatory drug to be taken during the first week or 2 after your surgery. Your surgeon will also recommend a cooling therapy, like R.I.C.E. (Rest, Ice, Compression, Elevation). We highly recommend use of a Cold Compress or Ice Pack at this stage for 15 to 20 minutes at a time, several times a day, to control your inflammation and reduce your pain. Rest at this point is vital to your rehabilitation plan depending on the surgery you have undergone. If you have had arthroscopic surgery with minimal internal wounding from your surgeon, you may be encouraged to start movement early or as soon as possible. Limited movements of the hip/knee will be required in most cases after the surgery. If you have had an invasive open surgery, then you may be encouraged to rest longer at first before starting movement. Depending on your type of surgery, rehabilitation with a physical therapist will begin 2-6 weeks after surgery. Your doctor or surgeon will advance you to the next Phase of rehabilitation when there is no evidence of inflammation or swelling in your hip. If you have had arthroscopic surgery, your doctor may expect that you are able to move your hip around pain free before moving onto the next Phase of rehabilitation. After your tissue starts to heal your hip will be in a weakened state and will not be as strong as healthy tissue for some time. This is why you need to be on "re-injury watch" and make the most of your physical therapy appointments and home therapies during your rehabilitation. It would be devastating if overdoing it at any point during the first few months of rehabilitation would send you right back into the operating room. After the initial healing of your hip surgery (when Step 1 and 2 of the healing process is done), temporary tissue will start to grow around tissue that was damaged during your injury or the surgery. Step 3 is the Growth of Temporary Tissue. Typically (though not always) approximately 2-6 weeks after surgery, your surgeon will recommend regular physical therapy appointments where you will be encouraged to (1) gain back range of motion (ROM), and (2) increase the stability of your recently repaired hip. Your physical therapy appointments will be 1-3 times per week, and your progression of movement in your hip will be the guide. You will start with the gradual movement of your hip in a free (non-forced) way with little weight or resistance, normally with very few repetitions of activity. Strengthening exercises will slowly increase in difficulty (with more resistance) after your surgery. Your hip will be stiff and painful at first, and simple, easy movements may seem challenging in the beginning. Don't be discouraged, your hard work will pay off in the end! At about 6 to 12 weeks (depending on your type of surgery) you still need to allow for healing from the surgery. Although you may be feeling much better and your pain is reducing, repaired soft tissue at 4 weeks is typically only 20% healed. At 8 weeks it will be about 40% strong and after 12 weeks the tendon is 60% as strong as normal tendon. The point where the pain decreases yet the tendons are still weak is a critical point. This is the stage where you need to be very careful about re-injury. At Home Stretching/Exercise - Your therapist will encourage you and tell you just how important it is to commit to regular exercise at home as well as in the clinic. You should be doing home exercises up to 3 times per day. They will give you the exercises and guidance based on your overall hip soreness level and your morning discomfort. We advise that you apply a T•Shellz Wrap® treatment to help induce "deep heat" before stretching (or exercise). Apply a TShellz Wrap treatment for approximately 15 to 20 minutes (finishing 15 minutes before exercise) to help increase elasticity and flexibility of your tendons, ligaments and muscles. The increased elasticity will help minimize tissue tears and scar tissue growth (increase ROM and decrease re-injury risk. Controlling post-exercise swelling and inflammation is crucial during this Phase. Any sign of swelling or inflammation after exercise may be an indication of minor re-injury to your hip or surrounding tissues and muscles. Control your inflammation immediately after exercise with a 15 to 20 minute cold treatment. If you are not careful to treat your swelling or inflammation immediately after exercise you may experience a set-back in your recovery. Your doctor, surgeon or physical therapist will advance you to the next Phase of rehabilitation when you show measured improvement of range of motion (ROM), strength, stability and flexibility of your hip. The level of improvement will depend on the severity of your injury and the type of surgery you have had. For example, if you have had a relatively simple arthroscopic repair of tissue, you may be expected to move the hip around before moving to Phase 3 of your rehabilitation. After temporary tissue has grown (Step 3 of the healing process), this temporary tissue will go through different stages of conversion into healthy, normal, flexible tissue. This is Step 4 of the healing process (Complete Tissue Re-Growth). Before converting into healthy tissue, temporary tissue will often become tough, dense, fibrous scar tissue. Scar tissue has an unorganized, inflexible tissue structure, which makes it brittle. Scar tissue will provide your injury with more long term fusing power, but will also stick to surrounding healthy tissue in your hip. The growth of this scar tissue is what stiffens your hip and lower back, restricting movement and flexibility. This Phase of your rehabilitation will focus on an increase in activity level in order to regain full range of motion (ROM) and muscle strength in your hip. Continued exercise and activity will break up and soften scar tissue. 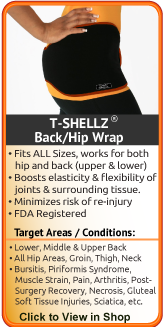 Use of a Back/Hip T•Shellz Wrap® BEFORE exercise/stretching and use of a Cold Compress or Ice Pack after exercise and activity is highly recommended. Like we mentioned before, controlling your pain and inflammation will go a long way to reduce your risk of re-injury. If you are noticing any recurring inflammation, you can continue cold treatments as recommended by your doctor. Your doctor or physical therapist will advance you to the next Phase of rehabilitation when you have regained full ROM (range of motion) without pain in your hip. You may also have to pass clinical exams or tests of your muscle strength, balance, stability and flexibility in order to be cleared for Phase 4. When your overall condition and range of motion has improved your doctor or physical therapist may clear you for a return to work or athletic activity. In many cases, they may recommend that you continue muscle strengthening and stretching instructed during your rehabilitation in order to maintain healthy ROM of your hip. Additional cardiovascular exercise will also be encouraged. If you are an athlete or have a job that requires extensive physical capability, your doctor or physical therapist will likely advise a very gradual return to previous activity. Even if you have been cleared to get back to activity, you still must be careful with the activity you take on. You need to keep in mind that your hip won't be back to 100% for some time (recovery rarely reaches 100%) and so continued stretching with the exercises and stretches outlined in the ebooks and treatment with T•Shellz and cold therapy will maintain good health of the hip and significantly reduce your risk of re-injury. 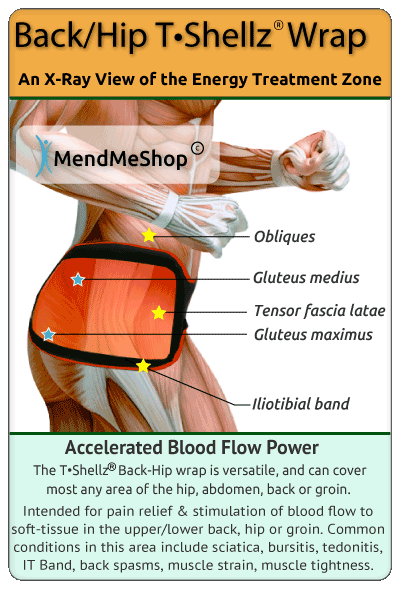 The Back/Hip TShellz Wrap is a safe, electromagnetic energy device that will help reduce scar tissue, increase blood flow to the area (and thereby accelerate the body's own healing process). when applied before stretching, the Back/Hip TShellz Wrap will help the connective tissue in your hip joint elongate, and stay elongated. This means that it helps improve your range of motion which is exactly what you want when trying to recover from soft tissue damage in the hip. As with any type of surgery, the surgeon will weigh the costs versus the benefits of performing surgery on a particular case. Scar tissue is something that cannot be avoided during surgery, and the surgeon will determine if the probable outcome will be better even after the scar tissue from surgery is considered. Scar tissue is something that will be in your injury before and after your surgery. The growth of scar tissue is what causes stiffening in the hip, restricting movement and flexibility. Scar Tissue is something that can't be avoided during surgery. Your surgeon will determine if the anticipated outcome from surgery will be successful even with the build-up of scar tissue that will happen after the procedure. Overall, the surgeon may be able to remove a lot of the initial buildup of scar tissue around the injury and in doing so, achieve a positive outcome from the surgery. listen well to your physician, and remember to stick to your conservative treatment plan. Using these therapies every single day will help minimize the amount of scar tissue that will grow in the wound. know that the TShellz Wrap will help reduce scar tissue and increase blood flow to the area (thereby accelerating the body's own healing process). Treating your hip with this device after surgery is probably the easiest and most effective home treatment device to accelerate your recovery. 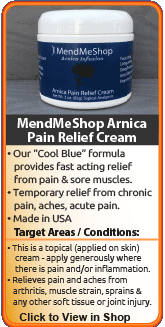 Do not use if there is a lot of swelling, use a Cold Compress or Ice Pack instead. use the TShellz Wrap before physical activity. Deep Tissue Therapy treatments increase flexibility and elasticity of soft tissue, improve range of motion (ROM), reduce stiffness and tightness and reduce the chance of tissue strain during activity. Rehabilitation after your hip surgery is just the beginning of your recovery process. Even after you've had surgery to fix your hip and deal with the build-up of scar tissue, it is improbable that your soft tissue will heal 100%. From this point forward, it is more important than ever to be careful with your hip. It is almost a certainty that your hip will be weaker now, and your risk of re-injury is just that much higher because of this. 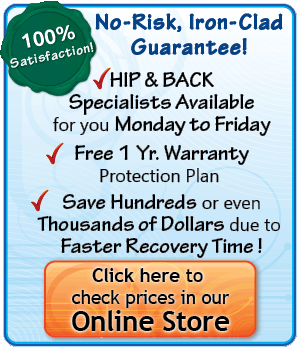 It's simple to manage long-term healing of your hip with conservative treatment methods that can be used in the comfort of your own home. If you're looking for an all-natural form of pain management and long-term healing solution for long-lasting relief, seriously consider the benefits of incorporating the Back/Hip TShellz Wrap into your treatment plan. A Cold Therapy can help you to decrease post-operative pain and swelling while also managing any pain from occasional inflammatory flare-ups (re-injury). Consistent treatment with a Cold Compress or Ice Pack will effectively reduce your inflammation, draw the pain out of your hip and gently numb the nerve endings in your tissue for rapid, long-lasting pain relief. During your last few stages of rehabilitation, while you're undergoing physical therapy and focusing on improvements to your range of motion, it's important to maintain healthy blood flow in your hip. Strong and healthy tissues need a solid local circulatory system, and this is exactly what our TShellz Wraps are made for. Reduced blood flow slows down your recovery process. If your tissue remains in this condition, you'll always be at risk of re-injury that will severely set back your healing progress. 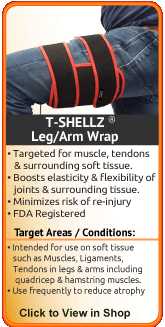 Use TShellz Wraps regularly to prevent re-injury and keep your muscles, tendons and ligaments elastic and flexible. Healthy blood flow is vital to the healing process after hip surgery. Your blood flow is what brings oxygen, nutrients, anti-bodies and energy (things needed to heal) into your damaged tissue. Blood Flow promotes tissue re-growth, strengthening the delicate work your surgeon has done. Regular treatments with Deep Tissue Regeneration Therapy via the TShellz Wrap will help you increase blood flow for up to 4 hours with just one 20 minute application! There simply isn't a better product on the market to increase your body's natural healing process and provide long-term health benefits. Tendons, ligaments, muscle and other soft tissue in the hip are all meant to be soft and flexible, ready to work and move extreme forces in everyday activities. When I say extreme force, I mean try to imagine the amount of force that your hip handles, even when you are just walking, let alone running, jumping or climbing stairs. As mentioned on the home page, a stumble during a walk can put peak forces of over 800% of your body weight on your hip! Scar tissue will form fast to deal with a soft tissue hip injury, and this scar tissue will attach to EVERYTHING in the area, including the surrounding healthy tissue as well. This can result in a fusing together of the soft tissue in your hip that shouldn't be fused together, and this will cause extreme pain when you move your hip - it is literally ripping scar tissue. This is why physical therapy is often painful - the therapist stretches the joint, forcing the scar tissue bonds to break so you can regain your range of motion. Scar tissue is a major problem especially when it comes to a hip injury - causing your injury to become chronic, and taking months or even YEARS to completely heal! You can quickly minimize scar tissue growth and reduce risk of re-injury to your hip muscles/tendons/ligaments by increasing blood flow to that area and increasing the elasticity of soft tissue in the area. Treating yourself with the Back/Hip TShellz Wrap is the easiest and most effective way to accelerate your recovery, increase soft tissue elasticity and deal with stubborn scar tissue. What is DTR Therapy? It's a substantial increase in the flow of blood to soft tissue in the hip without the need to exercise your already damaged tissue. Have you seen what happens when you add water to a flower wilted from drought? In essence, your injured hip is much like a "wilted" flower; your body wants to heal its injury, but needs lots of nutrients to do it. Blood brings new life to your cells by delivering healing nutrients and oxygen that are vital to your tissue. In addition, the blood carries away toxins and cellular waste cleaning the area and healing it faster. Without a good supply of blood, your injury simply won't heal properly. With DTR Therapy your injured hip is constantly being fed with healing, nutritious, oxygen and energy filled blood. This is exactly what your body needs to heal. In order to get maximum blood flow to your hip, you need to help your body stimulate blood flow. DTR Therapy is the fast, easy and pain-free way to increase blood flow and invigorate your body's healing process. It's a key tool for dealing with recovery from soft tissue injury in the hip properly. BEFORE exercise, workouts or activity of any kind to increase elasticity of tendons, ligaments and muscles of the hip and lower back, and decrease the risk of re-injury. Anytime you feel your hip has been over-extended, over-worked, twisted, strained or sprained causing pain and swelling. Any other situation where you need to draw the pain and inflammation out of your hip. If your doctor thinks you might be able to avoid surgery by using conservative treatments, you can join our many customers who have had great success treating themselves with the powerful treatment products we offer through MendMyHip. Iliotibial Band Syndrome, Snapping Hip, Bursitis of the Hip, Tendinitis or muscle spasms of the hip, impingements and other soft tissue hip injuries are not uncommon - it can happen to anyone. Right now, there are thousands of doctors and physical therapists dealing with patients that require a solution to heal their injury as fast as possible. Maybe they are just patients that are unwilling to just take pain pills, lay in bed and wait or perhaps they are patients with extensive access to medical care with a great insurance plan. Even fortunate patients such as this have greatly benefited from boosting their PT and medical treatments with home therapies using the products we have recommended after getting approval from their doctor or PT. Regardless of who you are or your reasons, if you want to be proactive about properly addressing your hip injury and minimizing the negative impact it will have on your lifestyle, consider accelerating your therapy at home with Deep Tissue Regeneration Therapy through the use of a Back/Hip T•Shellz Wrap®. We have many happy customers that have healed their injuries much faster than even they had hoped for and significantly reduced their pain during treatment and through the healing process. Doctors and Surgeons are always improving the technologies used in surgery, and results from surgery now are much more positive than they were in the past. However, all surgeries introduce scar tissue, and recovery from hip surgery is often disappointing. If you do wind up getting surgery, know that rehabilitation at-home while attending regular physical therapy or doctor appointments is vital for your overall recovery. It is especially vital to the hip, knee, ankle and shoulder areas, as they consistently handle extreme forces (body weight). 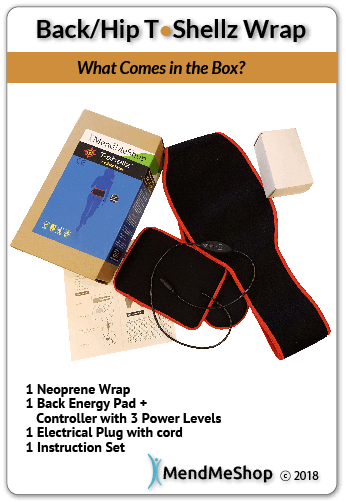 Consistent exercise and conservative treatment on a daily basis during your rehabilitation while working with your doctor, surgeon or physical therapist is key - and this is why you should seriously consider maximizing your recovery by using the Back/Hip T•Shellz Wrap® at home once you are approved for physical therapy. 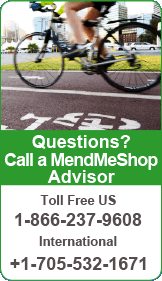 MendMyHip.com stands out in this regard as our goal is to help you keep your hip healthy for the long-term in a cost effective manner. This might mean healing your hip without needing surgery. If you couldn't avoid surgery, then our tools can also help you recover from surgery more quickly and completely.. Consistent use of home conservative treatments will help keep your hip joint as healthy as possible. Having a healthy hip joint will minimize your risk of a degrading hip injury that may eventually turn chronic. 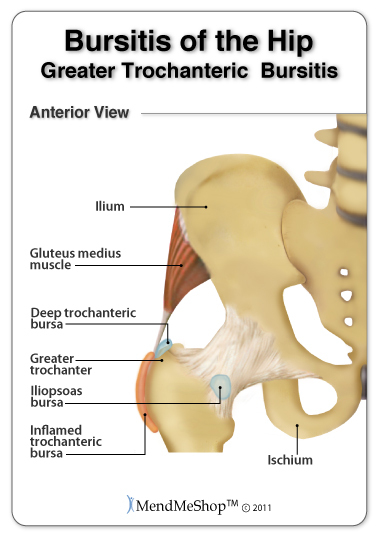 Some common chronic hip conditions are arthritis, osteoarthritis, tendinosis and bursitis (a common condition immediately following surgery due to irritation during the procedure). Following surgery, continued use of these therapies will result in a faster recovery and more complete healing. 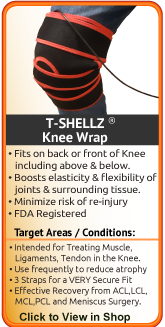 Ask your physical therapist about the T•Shellz Wrap® and if it is a suitable treatment option for your recovery! 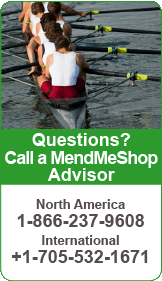 As with all medical devices, make sure your physician is aware of any treatment plan you decide to take. Learn more about how the T•Shellz Wrap® helps with the healing process.